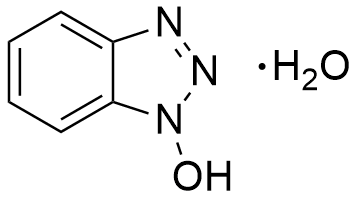 N-Hydroxybenzotriazole, developed by W. König and R. Geiger in 1970 was the most popular additive during the last decades. HOBt is one of the most effective suppressors of racemization in carbodiimide-mediated reactions. The most important drawback of the additive lies in its explosive character, especially in water-free form. Therefore, its availability is more restricted today but it can be substituted by more stable additives as OxymaPure and K-Oxyma. Polymer-bound HOBt is used for the formation of medium ring lactams with DCC in the presence of resin-bound esters and also for amides synthesis. L. C. Chan and B. G. Cox J. Org. Chem., 2007, 72, 8863-8869. K. D. Wehrstedt, P. A. Wandrey, and D. Heitkamp Journal of Hazardous Materials, 2005, A126, 1–7.